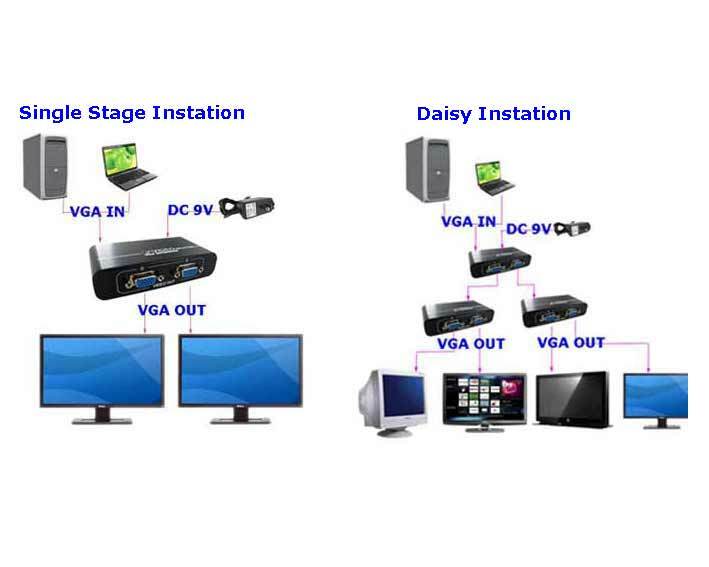 This is a 1 in 2 out VGA splitter, which enables two monitors, projectors, LCDs to share one PC.You can choose USB port or AC adapter for power supply. It is an ideal item for large screen projection system, multi-media conference room, ticket office, teaching showing, bond/finance/futures broadcasting and wall selling, etc. It allows a computer to deliver the same image on two different monitors. Display the same image on 2 monitors simultaneously. Besides, the unit can be daisy-chained to handle as many monitors as the installation requires, making it an excellent solution for public broadcast systems.You can even extend the monitors about 160 feet from your computer! The video splitter doesn't require anysoftware and is easy to install. Strong metal casing in a compact box is perfect for the most demanding industrial and home applications. This video splitter is your best choice. High clarity: the maximal resolution is up to 1920 x 1440. Support ultra-high 350 MHz video bandwidth(-3dB). Power LED indicator, can choose USB port or AC adapter for power supply. Easy to install, no additional software needed. 1 x 2 Port VGA Splitter. i got this to switch from my monitor to my lcd tv works great. Great buy. The price is great the simplicity of installing it was a piece of cake. I am not IT knowledgeable but finding this on the net and having it work just by plugging in 3 cables made my life easier. I will be using this product for anyone in the office that needs it.